Dr D G McMillan who DXed at Kurow in the early 1930s. Dr Gervan McMillan had his medical practise at Kurow, North Otago, connected with the Waitaki Hydro Medical Association during the construction of the new Waitaki power hydro dam. He was a member of the New Zealand DX Club and had the number DX 15 OC (Otago). The C is thought to represent Canterbury, it was OT for Otago in 1939. 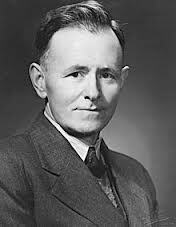 He became associated with the Labour Party and in 1935 he stood for Labour and won the Dunedin West seat. Three years later he was appointed Minister of Marine but ill health precluded him from further politics. Later he was elected to the Dunedin City Council and Otago Hospital Board. He died on February 20 1951, age 46. As a result Gervan McMillan’s collection is not large but what is there is most interesting, especially 70 years later. The card section is nicely held in a photograph album. It would appear his first report was sent February 16 1931 to WMAQ the Chicago Daily News owned station. KFRC San Francisco verified his March 4, 1931 report but, because he did not include a 10-cent stamp there was no Ekko stamp. He probably would not know about the stamp. 2FC Sydney appeared thrilled to receive a report of their daylight transmission being heard in New Zealand as were 2UE. The 2UE card is unique in that it is 23 x 19 cm and in the form of a Log Card with AWA radio advertising down the sides and across the top and bottom. In the centre are two columns, one has space for Sydney stations with 2UE printed and alongside under the heading Distant Stations is listed Dr McMillan’s report being confirmed. He has two such cards. Reception from America must have been great in those days as he collected many verifications from the States and KVOO Tulsa, Okalahoma in April 1931 issued the same style of card as did in 1944. It would look as if, during his rounds, he was caught short of writing material for on one occasion the back of a KRLD card had been pressed in to record a patient’s medical note! Many stations issued Ekko stamps which today would be valuable. Just to prove long distance stations could be heard in those early days he has letter verifications from Radio Journal, in Bratislava, Czechslovakia a “branch establishment” of Prague. The Post and Telegraph Department in Bangkok confirmed HSP1 on 350 metres with 2.5 kW. They were also testing a shortwave station HSP2 on 41 metres with the same amount of power. The Indian State Broadcasting Service confirmed a report to VUB on 357 mtres. Zealand in Christchurch the wording made me have a grin, but that was the way it was done in those days. “Your letter of the 14th instant is before us for attention.” They confirmed he had heard 1YA 2YA 3YA and 4YA. Today, even with so many radio stations on the air, the privately owned AM stations in New Zealand which carried out pioneering broadcasting, hold interest to DX listeners. Stations like 2ZE in Eketahuna, “The Golden Voice of Gisborne, NZ” was the slogan of 20 watt 2ZJ which was on the air every day for periods except the authorised silent day on Thursday. (Many of the private B class stations had silent days when they did not transmit. I cannot confirm whether this was voluntary or a Post and Telegraph Department requirement.) This station was finally sold to the NZBS in the 1950s. The well known Parsons Radio Supplies station 4ZP stated their power ranged from 50 to 100 watts, while Frank Barnett who owned Barnett’s Radio Supplies in Dunedin operated 4ZO on 1080. It is interesting that a son is still in radio at Wanaka and was largely responsible for Central Otago listeners being able to hear Radio New Zealand National Programme when he developed a special antenna. Across the Tasman the Australian stations are of interest, including one from 2UE Sydney with a photograph of a “millions” of people listening to a broadcast of a test match in 1930. An interesting one is the AWA VK2ME “The Largest Broadcasting Station in the Southern Hemisphere” located at Pennant Hills, Sydney, with 20 kilowatts. It was used for wireless telephone service to England and 22 European countries as well as overseas broadcasting. Australia’s population was then 6,3 million. Three former NZ DX Club members recall a meeting of the newly reformed Otago branch in 1941 when Dr McMillan attended and displayed his QSLs. Two League members, Murray Lamont and Jack Fox, and the then president, Ron Williams ZL1RAW can still recall that meeting and listening to his DX experience of 10 years earlier. They remember too, cycling in dark wartime blackout streets to the Williams home on that night. While Gervan was unable to continue the hobby, his collection is a valuable contribution to the history of the DX hobby in New Zealand and preserved for the future of this country’s history.